People go through a lot in their life. We all go through different kinds of journeys and moments. Each of us goes through different kinds of hurdles and obstacles. And somewhere along the road, people got lost in the search of the reason of their existence. And somewhere along the path, people are stumbling down only to find themselves trying hard to get up once again. And somewhere along the way, people are living their life feeling lonely; aching for home. Taking a look back on the life they have lived so far, people are longing for somewhere they called home. It’s where their journey begins and it will be where their journey ends. It’s where they can be themselves, without worrying too much about which identity they put on. It’s where they can feel safe while sharing their deepest dreams and fears. It’s where they can always come back and rest their head after a long tiring battle between idealism and ambition, greed and compassion. And for some people, home is the person we hold most dear. 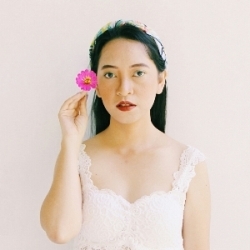 It’s the person we cherish the most; our significant other. 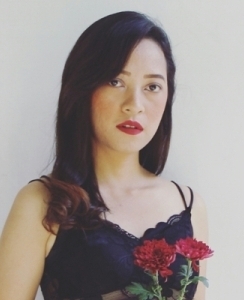 I rarely (or almost never) receive a request from people to write a lyrical approach towards certain song (though I do open for request anytime and from anyone and about any song). Hence I feel really honored when I got a request today. Moreover, this request came from my significant other, Vidi Mahatma. Well, I guess this is a special occasion. 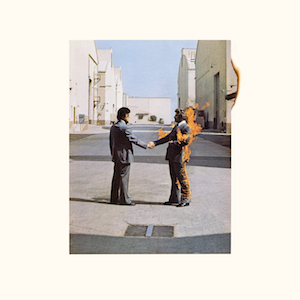 So, here, I proudly present a classic titled “Wish You Were Here”, performed by the legendary English rock band, Pink Floyd. This progressive rock track was released on September 12th 1975 as the title track for the band’s ninth studio album of the same name. (Yeah, it really sounds like Vidi since he is so into 1970s things, especially music). 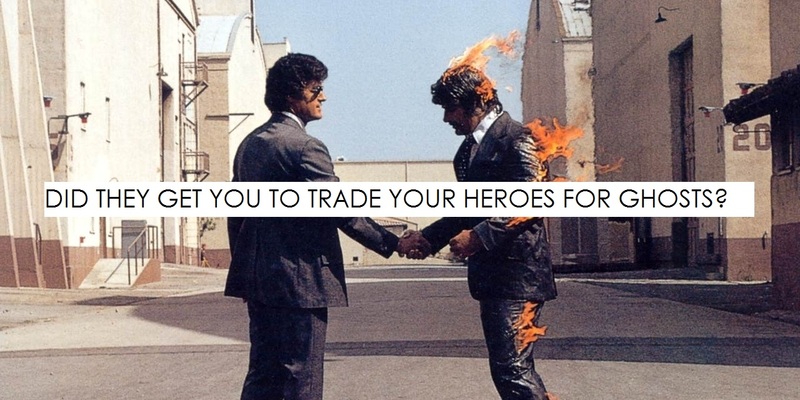 Written by Roger Waters and David Gilmour, “Wish You Were Here” lyrically relates both to Syd Barrett’s condition (former Pink Floyd member whose mental breakdown had forced him to leave the band seven years prior to the release of this song), and to the dichotomy of Waters’ character, with greed and ambition battling with compassion and idealism. At first, writing about this song was quite a difficult challenge for me. However, it wasn’t hard at all to fall in love with this song. Hence it made me easier to get the feeling of the song. Anyhow, welcome to October. And I hope you like my lyrical approach towards this song, dear Vidi Mahatma. It’s a great opportunity to receive this request. And I can understand you better through this song. Thank you so much. I wish you were here, or I were there. People live their life and have their own battle. Some people battle with the society, while some other battle with the social structure. Some people battle with poverty, while some other battle with freedom. And people say that the greatest battle of a human is the battle they have with themselves. “So, so you think you can tell Heaven from Hell, blue skies from pain. Can you tell a green field from a cold steel rail? A smile from a veil? Do you think you can tell?” The hardships of the life throughout history has made people’s minds are torn between good and bad, logic and conscience, between what’s rational and what’s ideal. Meanwhile, most of us don’t even realize that things that have made our minds are torn is socially constructed by the system of the society itself. And for those who realize it, that is when the battle inside themselves begins. Can we really differ heaven from hell? Can we really differ happiness from sadness? Can we really define what’s good and what’s bad? From all that we know, they won’t exist without one another. There won’t be heaven without hell. There won’t be happiness without sadness. There won’t be good things without bad things. Hence, the one question that people never stop asking to themselves is the question of identity. Which one are we? However, should we really choose between those two polarized things? Eventually, every polarized thing in this world is (again) constructed by the social system. Yet, knowing that doesn’t mean the battle inside is over. The battle will always be there as well as the question of identity. It’s the battle between idealism and ambition. “Did they get you to trade your heroes for ghosts? Hot ashes for trees? Hot air for a cool breeze? Cold comfort for change? Did you exchange a walk on part in the war for a lead role in a cage?” And this madness of life (of the advance capitalism society) has pushed our mind and character to be torn between our idealism and our ambition, between our compassion and our greed, between our dream and our obligation. For some people, the social construction has made them difficult (or even nearly impossible) to feed themselves with idealism, to make money with compassion, to live their life with their dream. For some people, their mind and character have to be splitted up because their dream doesn’t go along well with their obligation; what they want to do doesn’t go along with what they have to do. Within this never ending battle inside ourselves because of the dichotomy, we feel lonely aching for home. 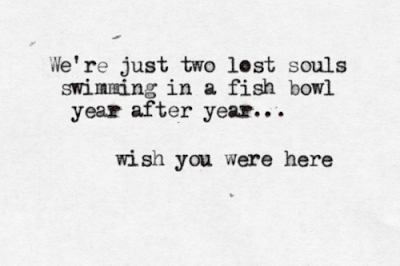 “How I wish you were here. 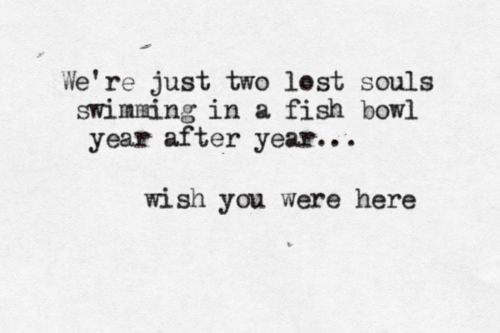 We’re just two lost souls swimming in a fish bowl, year after year. 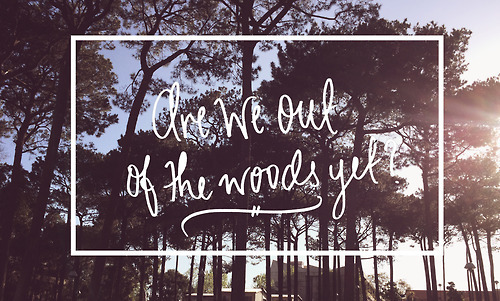 Running over the same old ground, what have we found? The same old fears. Wish you were here.” And home is the person who knows well about what we’ve been through, the person whom we always feel safe to tell our anxiety and share our fears, the person who can understand this battle we have inside with ourselves. It’s the person who can always accept and embrace all of that with an open heart and never ending willingness to know ourselves better. It’s the person whom we always wish to be here to stand by us while facing all of those hardships in life. We are all lost souls who wander around time after time, searching for things they do not always be able to figure out. And there are connected souls who find each other along the way. Though they are going in a separate way after that, no matter how they wander around, souls tend to go back to who feels like home. The battle of the dichotomy is always inside us. It may torn us inside yet there is always a home we can go back to whenever we feel lost. And our soul knows our home. Our soul can always recognize it. You have requested this song, Vidi Mahatma, and now I can understand better what you go through and how you feel; the battle you have within. And I wish I were there too, to stand by you through all the battle. We’ve been through a long way since 2011, (same old ground and same old fears, yet we grow through that) and we still have a long way to go in the future (and we will always grow). All you need to know, and I want you to remember, is that you are not alone in this fight. You are never alone. We share the battle and just know that I’m always on your side. All you need to do is staying strong and getting stronger. I may be physically far away, yet my soul is always with you. Can you tell a green field from a cold steel rail? A smile from a veil? Do you think you can tell? Did they get you to trade your heroes for ghosts? Hot ashes for trees?